With Chrisjen Avasarala we welcome the Secretary General of the United Nations to FedCon 28. More precisely, Shohreh Aghdashloo, who impressively plays this role in the science fiction series The Expanse in the 23rd century. The actress, who was born in Tehran, Iran, was one of the most famous film greats in the country at a young age and took part in many national productions. In the course of the Islamic revolution in 1978 Shohreh Aghdashloo left Iran to complete her education in England. She holds a Bachelor’s degree in International Relations. Aghdashloo also continued to work intensively on her acting career and finally ended up at the Hollywood Dream Factory in 1987. Over the years she became more and more famous there. In the TV business she convinced as an undercover terrorist Dann Araz in the fourth season of 24: Twenty Four at the side of Kiefer Sutherland. She has been featured in many other well-known series so far. Among them ER, Dr. House, Grimm, Marvel’s The Punisher or in a speaking role for The Simpsons. Her credits in cinema include productions like X-Men: The Last Stand and Star Trek: Beyond. 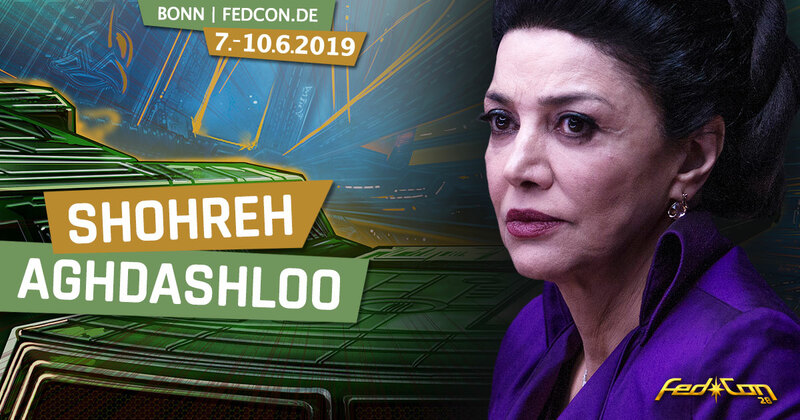 Be curious to hear what Shohreh Aghdashloo has to say about her eventful career and especially about her current role in The Expanse together with her cast colleagues Nick E. Tarabay, Cas Anvar, Dominique Tipper and Frankie Adams on FedCon 28. Your ticket is now waiting for you in the Ticket-Shop.